Theresa Linden is the author of award-winning Battle for His Soul and Roland West, Loner (Catholic Press Association Book Awards, 2016 & 2017) two books in her contemporary young adult West Brothers series. Raised in a military family, she developed a strong patriotism and a sense of adventure. Her Catholic faith inspires the belief that there is no greater adventure than the reality we can’t see, the spiritual side of life. 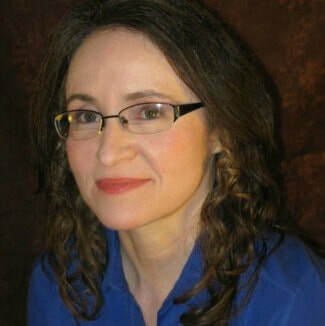 She has eight published novels, including a fast-paced dystopian trilogy that tackles tough moral questions of our day, two short stories in Image and Likeness: Literary Reflections on the Theology of the Body (Full Quiver Publishing), and a short story in Secrets: Visible & Invisible (CatholicTeenBooks.com). She holds a Catechetical Diploma from Catholic Distance University and is a member of the Catholic Writers Guild and the International Writers Society. A wife, homeschooling mom, and Secular Franciscan, she resides northeast Ohio, with her husband and their three teenage boys. Her perfect husband would love Jesus above all and would love her because of her love for Jesus. He would be faithful and gentle and have a heart for others. So how did Caitlyn Summer end up marrying the bad boy who had gotten her best friend pregnant in high school and pushed her to have an abortion? Unable to remember the past three years or understand why she would’ve moved so far from home, Caitlyn can’t believe she willingly married such an overprotective, bossy, and jealous man. In this emotionally-charged mystery romance, ANYONE BUT HIM, Caitlyn struggles to solve the mysteries of her amnesia and her marriage. Suspicious circumstances surrounding her husband tempt her to leave and start life over, but they also challenge her Christian faith and convictions. The arrival of her first love, her husband's younger brother, intent on helping her regain her memory, offers a glimmer of hope. Together they uncover secrets involving her coworkers and the local abortion clinic, but nothing to explain why she married this man. Who changed – him or her? In two weeks her vocation begins. She must find a way out. As the day draws near, Liberty is attacked. She’s about to lose consciousness when someone rescues her. She wakes in an underground facility, discovering a secret group that watches over Aldonia. Before they return her to society, she witnesses the rescue of a man scheduled for government re-education. They rescued him. They can rescue her. ​She must escape and repair the damage she’s done. Liberty 554-062466-84 of Aldonia bides her time in a tiny cell, plotting her escape from the re-educational facility. Her crime: not accepting her government-assigned vocation. But the punishment extends to more than just herself. The once-secret colony that offered her freedom has been exposed and its members placed in government facilities for re-education and integration into society. Now free, Liberty wants to rescue the colonists from the three separate facilities that hold the children, teens, and adults. But she must avoid her pursuers, and Dedrick seems reluctant to work with her. 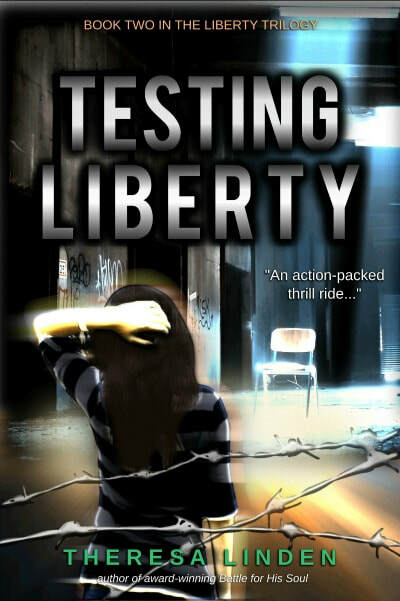 Set in the not-so-distant future, Testing Liberty is book two in the young adult Liberty trilogy. 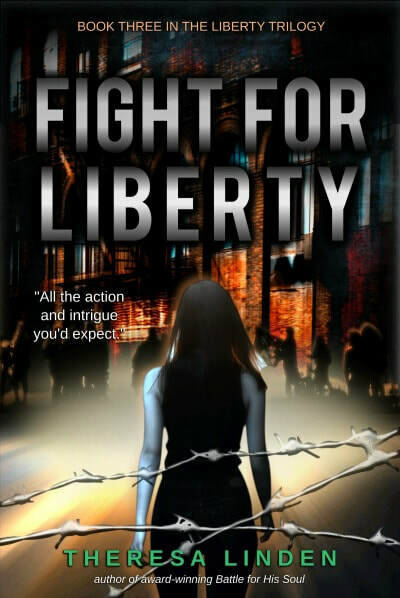 Moving from one trial to another, this story follows Liberty to her final sacrifice as she learns that true freedom is within, cannot be taken away, and is worth fighting for. "He has sent me ...to set at liberty those who are oppressed..."
Liberty 554-062466-84 of Aldonia has gained a deeper understanding of true freedom but having it for herself is not enough. Prompted by the inner voice that has guided her for years, Liberty is compelled to bring the freedom she possesses to others in Aldonia. While unsure of how to carry out this mission, she is willing to risk all to accomplish it. Threats from outside the Boundary Fence and threats closer to home cause chaos and confusion that have everyone unsure of what direction to take. Troubled by Liberty’s risky choices, Dedrick wishes he could convince her to leave for the colonies. But Liberty has chosen Aldonia over him. When faith, family, and freedom have been squashed, what can one person or even a group do to reclaim the culture?